For clients who already have a marketing plan and want to take full responsibility of executing their strategies. Coaching helps you address a pressing need and helps you really understand how to market your business. Coaching packages include value-packed hourly engagements with no minimum commitments. For clients who need a marketing plan and clear strategy for success, but want to take full responsibility for executing the plan. We will provide robust insights and valuable information that will help you refine messaging, target audiences, channels for promotion, and actionable recommendations for growing your business. For clients who aspire to generate a personal experience with their audience. We have writers, videographers, and photographers who create engaging content that captures your unique stories and humanize your brand. The shift into mobile computing has made video and photography more important than ever as users seek content that connects with them on an emotional level. Our technical development capacity includes website development and mobile and web applications. Websites are a key element to a trusted online brand and our team will align your marketing goals with the operations needed to leverage your web traffic. Mobile and web applications can set your business apart or provide an opportunity to create a new business. For clients who need someone to own execution of all, or some, of the daily marketing activities. We become an external team member that sets strategy and executes the day-to-day activities that put the strategy into action.Coaching is unlimited in this offering. Dependant on availability. Content reigns supreme. We create high-quality, valuable content that attracts, informs, and engages your audience. Meet your audience where they are. We develop strategies to help connect with digital influencers and deepen audience engagement. If content is king – email is queen. Let us create and automate a series of emails so you can set it and forget it. Digital Advertising is essential to reaching an audience. We help build your brand awareness and gain new customers. Mobile applications are the now and future. We create simple to advanced, native and hybrid, apps for your business. Unlock hidden treasures that turn coal into diamonds. We conduct research that enables you to better understand your target market and audience. Your website is the window to your soul. We create visually engaging websites that tell your brand story and anchors your online community. Getting discovered in search engines is essential in the modern digital world. We use white hat tactics to ensure you break through the clutter. Imagine life without Google Maps – likely many starts and stops. We create a roadmap for business success in the modern world that will ensure you have a solid plan. As more people go online to find information and evaluate offerings, it is now imperative for organizations to have a solid strategy for creating and promoting engaging marketing content. With a scrappy entrepreneurial ethos, we develop and repurpose content for a variety of communication channels. We understand the uniqueness of each channel and will create top-notch content for your target audiences. We begin each project by reviewing background materials and gathering information from a variety of stakeholders. We approach form and function simultaneously, clarifying objectives and constraints, uncovering challenges, and exploring how to turn your brand story into a visual adventure for your audience. Our approach entails discovering insights from the questions prospects ask at the various stages in the sales process and devising content that addresses those questions. Buyer Personas: Detailed analysis on the people most likely to comprise your target audience. It’s important to know the reader of the content before planning and writing it. Buyer Journey: Identifying stages buyers take to research, evaluate, and purchase from you. It’s not enough to know who is reading. We need to know where they are in their research and decision-making process. Content Mapping: Matching the questions asked at each stage with the right answers and the best content type in order to keep a prospect moving forward. Content Audit: Before recommending new content, we’ll review what already exists. Existing content can often be repurposed and optimized. Define the deliverable: Based on insights gleaned from your buyer’s journey, we’ll determine what content needs to be developed. Around 7 in 10 Americans use social media to connect with one another, engage with news content, share information and entertain themselves. Best of all, social media is one of the most economical ways to engage and build awareness. Learn more about the power of social media in this Pew Research Center report. Manage your reputation online – don’t let Yelp or Google Reviews destroy your business. We can develop a strategy that ensures you have a solid reputation online so that your happy customers shine through. If you don’t have happy customers then that is a bigger problem all together. Increase brand awareness (followers): o know you is to love you. The challenge is breaking through the internet clutter to reach prospective customers or clients. We help you grow a relevant audience on social media that will increase word of mouth business and referrals. Build relationships (engagement): Trust is at the center of every strong relationship. Now more than ever you can build community and relationships with influencers that will help your audience trust you and ultimately purchase from you. We help you increase your engagement on your social media posts and build trust. The more engagement you have, the deeper your connection with your audience and the more reach your organization will have. Reach Influencers – A recent survey revealed 84% of marketers plan on executing at least one influencer marketing campaign during the next 12 months (eMarketer). What exactly is influencer marketing? Imagine the influence that the most popular group of girls has in high school — what they wear, music they listen to and so on — becomes the cool thing to do. Now imagine as a company you are able to tap into their influence and get their endorsement for your product or service. Social media influencers, also referred to as thought leaders, are found in every industry and exist on all the primary social platforms: Facebook, Twitter, Instagram, and Snapchat. These platforms have given birth to famous internet celebrities and influencers down in the single-digit age group.These are the modern day child stars, and they are becoming more and more savvy about how to properly collaborate with brands for their own creative campaigns. Thought leaders’ opinions influence the general public more than other online sources. For example, “88% of customers trust online reviews by strangers as much as they would recommendations from friends.” (BrightLocal). Having a strategy to target these influencers is more imperative than ever. Increase website exposure (traffic): Make a customer not a sale. Our goal is to help you build a database of raving fans that turn into lifelong customers. Increasing your website traffic will directly influence your pipeline of leads and grow your customer base. We will focus on creating social media campaigns that drive traffic to your website. Social media is still a very economical way to target and reach the exact type of audience with whom you wish to build a relationship. With a passion for unearthing client insights, we want to know what makes your customers tick and draft messages that walk them through the buying funnel. Creating hyper personalized emails and automating them in a set-it-and-forget-it fashion is the key to being efficient and scaling your marketing programs. Strategy – We provide you with thoughtful and engaging contact strategies that optimize the experience of your subscribers and prospects and increase your profits. Design and Coding – Email marketing should look great and perform even better. Our email designers and coders create standalone campaigns and templates that drive results. Copywriting – From subject lines to compelling lifecycle messages, our copywriters have crafted hundreds of stage-appropriate messages that convert. Lead Nurturing and Drip Programs – We strategize and develop content for a sequence of emails to reduce your sales cycle, onboarding process, or whatever other goal you might have. Production & Deployment – Using your favorite email deployment tools or ours, we manage the entire campaign production process. We do it right, on time, every time. Email Automation – Our marketing automation experts will help you grow your sales and convert more leads, all while saving you time, money, and heartache. Managed Services (Full Service) – Working in concert with executives or in-house teams, we serve as a the full-service email vendor for companies that require some level of dedicated support. Integrations – Our experts easily integrate your ESP’s API with all of your third-party services such as CRM systems and ecommerce platforms. Advertising has evolved. It is no longer restricted to print publications, static billboards, radio, and television. We have entered a whole new era of advertising. Digital advertising can help tell the story of your brand. It also enables you to tell your brand story on the channels that your buyers frequent — through text, images, video, and more. For organizations that desire quick results, online advertising can be a great way to drive immediate response and is particularly beneficial for organizations looking to increase traffic to a website over a short period of time. We create a customized strategy and reporting system tailored to your needs and business objectives to ensure your measure of success is our primary goal. Providing you support and guidance while managing your ad campaigns, we are able to maximize the return on your investment by increasing leads and traffic to your site, or creating brand awareness with measurable results. We also specialize in hard-to-optimize Adwords Campaigns and can also overhaul, rebuild or hyper-optimize your existing campaigns. We are available for short-term or long-term consulting or management. Why is Amazon taking over the world? Because they have made it so simple to do business. It’s just as critical for small business owners to make it easy for customers and clients. As consumers spend more and more time shopping, scheduling appointments, and playing games on their mobile devices, it is imperative that business owners get wise and develop applications to make the lives of their customers, and potential customers, easier. Some interesting stats on mobile usage. Mobile users spend 174 minutes on mobile devices every day and mobile apps account for 89% of mobile media time, with the other 11% spent on websites. (Smart Insights). Business Insider’s premium research service, forecasts mobile commerce will reach $284 billion, or 45% of the total U.S. e-commerce market, by 2020. This will be largely driven by Millennials, who currently complete 30% of online purchases using a mobile device; this number jumps to 33% for moms and 43% for Latinos. Our approach to mobile and web applications is straightforward and entails five steps. We start the engagement off by listening and learning — we’ll try and get to know your business as well as the people who keep it running every day. We take the time to understand your operations, market positioning, and competition — and help you determine the most effective solution to your unique business challenges. We ensure that your app goals and objectives are clearly established before proceeding. Interactive high fidelity prototype – The prototype will give different stakeholders the first look at your app, and will help you validate the information you’ve gathered. The prototype will be the base developers use to start building the actual app. Alpha phase – the core functionality is present but not tested. The app is still extremely buggy, and non core functionality doesn’t exist. Beta phase – most of the proposed functionality is incorporated. The app has also gone through light testing and bug fixing, though some issues might be present. At this stage, the app can be released to a select group of external users for more testing. Release candidate phase – after the bugs in the beta phase are fixed, the app is ready for release. With mobile app development, it’s a good idea to test early and often. Different mobile devices respond in various ways. Our goal in the testing phase of the software development lifecycle is to break as much as possible — so we can fix it before going live with customers. Doing this will keep final costs low. The farther in you go into the development cycle, the costlier it becomes to fix bugs. The launch phase of the application development life cycle is critical to the success of your app. Mess up this phase, and all the hard work and money invested in the project will go down the drain. The objective of the launch phase is to get your app in the hands of as many users as possible. App Store Optimization: improving the ranking of your app in the app store is critical. SEO: You will need to rank for the keywords which describe your app, and can do this through a variety of tactics. Website or Landing Page: It’s important to create a website or a landing page specific to your app. Mailing list: Many apps have built anticipation before their launch and gotten high initial downloads by building a pre launch email list. Paid ads: You may consider using Google, Facebook, Twitter and other platforms to run ads. Public relations: PR and influencer marketing is also going to drive app downloads during the launch phase. The end… but not really! App development doesn’t end at launch, as your app is a live element that will require tweaks here and there. As users adopt your application, feedback will pour in and you may choose to incorporate that feedback in future versions of the app. This journey towards growing your business is in full swing and we are here to ensure you reach your goals. Marketing research unlocks hidden treasures that turn coal into diamonds — a struggling startup into the next Instagram. Any size organization wanting to become or remain competitive can benefit from marketing research. It also is an effective tool to assist your business planning. This process is about collecting information that provides an insight into your customers’ thinking, buying patterns, and location. In addition, this research allows you to monitor market trends and keep an eye on what your competition is doing. Market research lays the foundation for all of your marketing efforts, enabling you to promote your vision and offering it in a compelling way to your audiences. identify performance, pricing, or promotion opportunities. We begin each research project by defining your objectives and goals. Clearly defined objectives will help identify the best methods to conduct your research and ensure you achieve useful results. We utilize both qualitative and quantitative research in order to define and segment your target audience(s) and dive deep into understanding the unique challenges, objections, and needs they have. Primary and secondary research enables us to gather insights from a variety of sources. Deliverables and sources are detailed below. 81% of Americans say they conduct online research before they make a purchase (MineWhat.com). This means businesses in any industry can benefit from a website and trusted online presence. If your businesses do not have a website, or even one that is mobile ready, you could be leaving tons of money on the table. Having a website is just a foundation for establishing trust, and it’s important to have clear goals for leveraging your website traffic and capturing contact information to nurture prospects into customers. A content marketing strategy will ensure you are driving the right kind of traffic to your website and capturing visitor information. A great website is comprised of many elements such as design, SEO, UX, marketing automation, and content. The success of your website is determined primarily by its content. Good content will set your website apart from your competitors and ultimately win the hearts, minds, and wallets of your customers. A website catering to the right target audience and fitting in perfectly with your business needs, goals and vision is the first step toward building a successful business. The development process can be complex, but we simplified this process to make it economical for a wide range of businesses. This phase is the foundation upon which the entire project is planned and developed. It involves detailed requirement gathering, wherein key pieces of information, such as scope, objective, wireframes, and functional requirements for the project, are discussed. Third-party systems, such as APIs, CRM integrations, and other web services, are reviewed. Based on these inputs, an action plan comprising task breakdown, project timelines and milestones is prepared. Wireframes and guidelines gathered in the previous phase are used by the designer as guidelines to design the website. The look and feel of the website is very important for successful engagement and retention of target audience. An exchange of ideas between the designers, coders, and clients ensures the website precisely matches the needs and aesthetic preferences of the client. In the development phase, experienced programmers build the features/functionalities finalized in the discovery phase. This phase involves coding the business logic, integrating user interface with the backend database, and building custom features specific to the given project. Steps are taken to ensure the code complies with current web standards and is scalable. Before a newly built web application can be reviewed, it is essential to ensure it meets rigorous quality standards. Browser responsive testing, regression testing, functional testing, smoke testing, load testing and performance testing are the main types of quality assurance tests performed here. The development and testing teams work closely using an iterative process to guarantee the final end product is smooth and bug free. This phase involves review of the site by the end user/client. This step provides an opportunity for clients to perform a pilot test on the application with actual users and get real time feedback and suggestions for improvement. Testing will reduce or eliminate the opportunity for any major change requests once the application is rolled out to production. Once the website is fully reviewed and approved by client, the application moves to the final phase. The website is made available to the public. This very important final step requires a lot of preparation, sometimes from the start of the project. Data migration, server setup and configuration, code merge, domain name redirection and sanity test are some of the key tasks performed. Any web application requires ongoing maintenance, support, enhancements, and periodic updates. As more people go online to find information and evaluate offerings, it is now imperative for organizations to have a trusted online presence and solid strategy for getting found in search engines. 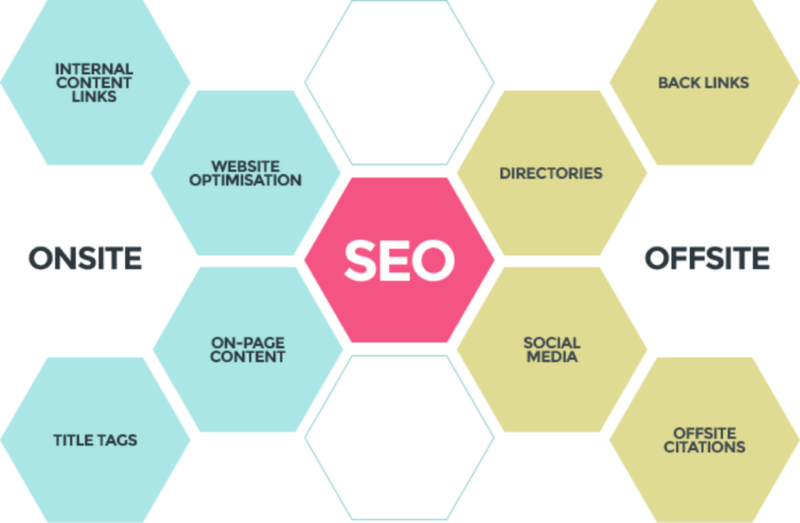 A content strategy lays the foundation for effective search engine optimization (SEO). As many marketers say, “SEO is 80% content.” Onsite and offsite SEO tactics work together to ensure your organization gets found by potential clients searching online. SEO goes hand in hand with web development. We ensure your website is operating most efficiently and is Google friendly (meaning you can rank higher at a lower price for advertising and your organic search is better). Every business needs a plan and a strategy that defines your vision, your goals and a roadmap for how you are going to reach them. Whether you aspire to start a business, are a new business owner, or already have a business, a simple business strategy can help you launch or take your business to the next level. A business strategy does not have to be complicated. In fact, some business plans can fit on a few sheets of paper. Don’t let business planning and strategy fall by the wayside because you don’t think you have the time; plan today and reap the benefits for years to come. A business plan is the foundation for additional departmental planning. Having an integrated and cohesive marketing plan that aligns with the business objectives is key to growing your business and competing in this highly competitive marketplace. A marketing plan allows each marketing technique to support the others, thereby creating a synergy of branding and growth for your business. It will be the roadmap that will guide you to success. Why do we provide so many services? Because we believe in integrated marketing campaigns that are able to reach audiences on a number of different platforms. Just because a company is small or medium sized doesn’t mean that they should have a piece meal and disjointed marketing experience. By providing a large range of marketing services we are able to ensure that clients’ messages are consistent and aligned throughout the online space. And that clients are only using strategies and tactics that will best meet their business goals. Our ecosystem of expert collaborators allows us to offer a range of services at an affordable price. Now small and medium size businesses can get the expertise generally afforded only to large companies. We love small businesses with big hearts and ambitious drive.